If you downloaded some videos from some social video sites such as Google Video, Youtube, maybe you do not have a special player for play FLV video that most video sites used now. 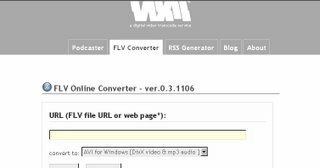 Do not worry, you can use FLV Online Converter to convert FLV file to some comment media file such as AVI, MP4, MP3. Even you do not need download media file first, you put that video's address onto the bar, and click "Start".